Tonight (Tuesday 12th July) at 7pm, tune into the BBC’s The One Show to see me in a boxing ring (yes literally). I, of course, wasn’t asked to be involved due to my strong right hook; The One Show wanted a war of words when they pitted me against a traditional high street estate agent; keen for us to discuss the pros and cons of online and traditional approaches to home selling. 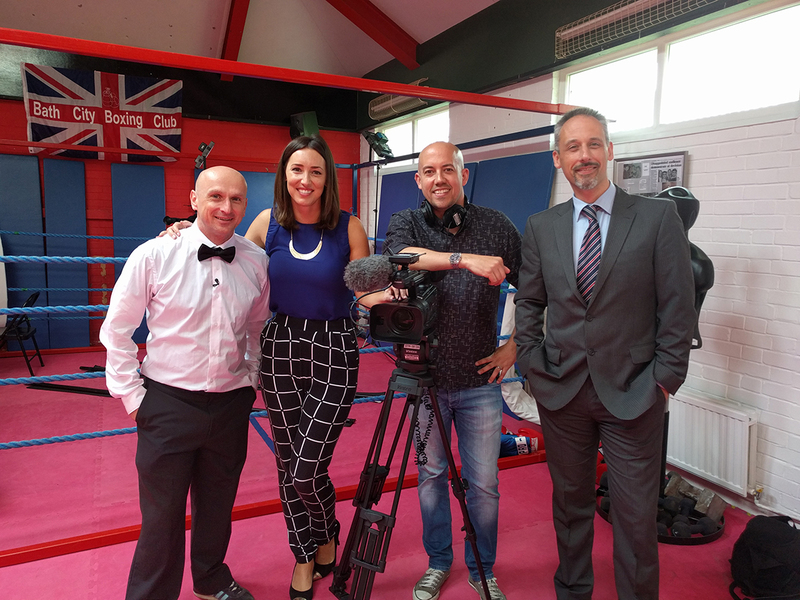 As I stepped between the ropes of the ring on the day we filmed, I was excited to hear how my opponent (Carey) was going to defend the service provided by the high street which, over the years, has resulted in seventy percent of Brits saying they mistrust estate agents. We actually agreed on some things; Carey appreciated how the technology we had created at Settled (which gives more control and transparency to the homeowner and buyer) could help traditional agents evolve. He agreed that the property industry needs to improve and that there’s increasing pressure on the high street to pull their socks up! Carey was also ready for a fight with ‘jabs’ including; “you get what you pay for” indicating that for Settled’s fee, you’ll get a lower level of service. However, he struggled to make this point stand. I countered that, in our case, lower costs don’t mean a compromise on service; actually, quite the opposite. We’ve stripped the unnecessary overheads: cars, offices, and we’ve directly addressed the issues. We are passionate about a fresh alternative to estate agents that’s built specifically for today’s consumers. What was really interesting when I retorted to Carey’s points was that the true meaning of what we’re doing at Settled came right to the surface; Settled’s customers. They aren’t using the Settled purely for the cost savings, they’re using it because they get everything they need to sell a home plus something else much more valuable; control and transparency. Settled is not just about cutting out exorbitant estate agent fees, it’s about mending something broken. For many decades, middlemen in this industry have not focused on the customer. Now, as more and more people become aware of alternative models, they’re flocking to them. Over the past three years there’s been a five hundred percent (Source: Zoopla) increase in the number of people selling homes via online agents. It’s fair to say that people are welcoming the change. As I was defending this need for change, something else sprung to mind. Recently we asked some of our sellers about their Settled experience. Among the statements around people’s pride in showing people around their own homes, enjoyment in being more involved in the decisions, one seller’s comments in particular stood out. Rachel (who sold her 3 bed home in Newcastle with Settled) said she felt ‘smug’. Her neighbours and friends told her not to take the ‘risk’ of going for something different and to stick to the local agent, but she listed her home with Settled in spite of the naysayers. She had her first offer in five days, two months later everything had gone through and she was in her new home having saved £3,164 in fees. It’s people like Rachel that save thousands and have a better experience that really typify what we’re doing at Settled. Another point I wanted my traditional opponent to digest was that, fundamentally, the way we do things in this world is changing. We want immediacy; access to services; technology that lets us do things in the here and now. We book our holidays, check reviews, move our money, buy our shopping, book our taxis and we do all this from our sofas, offices, or on the bus. Life is democratised, we’re no longer the passive recipients of a service, we demand and shape the service. The idea therefore, that we’ll continue to pay thousands of pounds for a service that has been characterised over the years by mistrust, malpractice and gazumping is simply unfathomable. Companies and industries cannot get away with poor service anymore. Our customers are more than your typical customer, they’re our inspiration, we build for and because of them. Their feedback is gold for us, the features, tweaks and changes we make are a direct result of them and they're telling us they want to be empowered, they want to do more and they don't want to feel shut out of the process. We know selling and buying a home is far from a perfect experience currently, however, we’re aiming to get it really close over the years to come; this relationship between us and our customers will move us there. We created Settled for all the people who’ve ever been unhappy with the property status quo. We’ve listened, heard and acted and we’re delighted we’re already making sellers happier. So tune in tonight to catch the show or watch on BBC iPlayer later and let us know what you think! Settled is an online platform that passes the power to sellers and buyers. Sellers get everything they need to sell their home better (valuations, photos, floorplans, sale signs, legals, support from start to finish, connections to vetted buyers, listings on all the major property portals) for a fixed one-time VAT inclusive price of £499 - no catch. Settled is passionate about empowering sellers and buyers to have real conversations, to be part of the process, to #besettled.